enough to access the frame slider mounting point. 2. 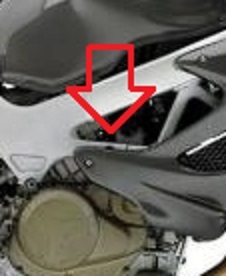 Remove the engine mount screw that the red arrow is pointing to in the photo above. 4. Remove the slider from the bracket. pointing away from the bike. torque wrench, Tighten to the factory torque specification. so the thread locker can prevent slider loss. 10. Remember to final tighten the slider screw- if using a torque wrench tighten to 25 ft/lbs. the long screw and the short spacer. Please contact us with installation questions.